Hot diggity dog, just $1 each?! Pick up your middle and high school friends from school tomorrow (Wed. March 23) and hop on over to SONIC for a $1 hot dog. 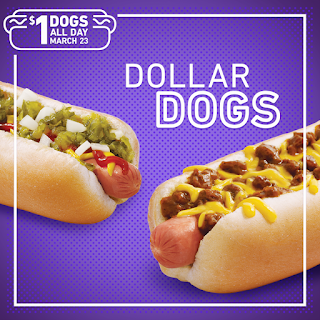 Includes only 6-inch Chili Cheese Coney and All-American Hot Dogs. Tax not included. Add-ons cost extra. Cannot be combined with other offers. Limit 5. Offer valid all day at participating SONIC Drive-Ins.